Personal statements are widely used as deciding factor in choosing the best candidates for top schools and programs. Admission committee used this in order to assess the applicant’s ability to showcase their capacity and express themselves. 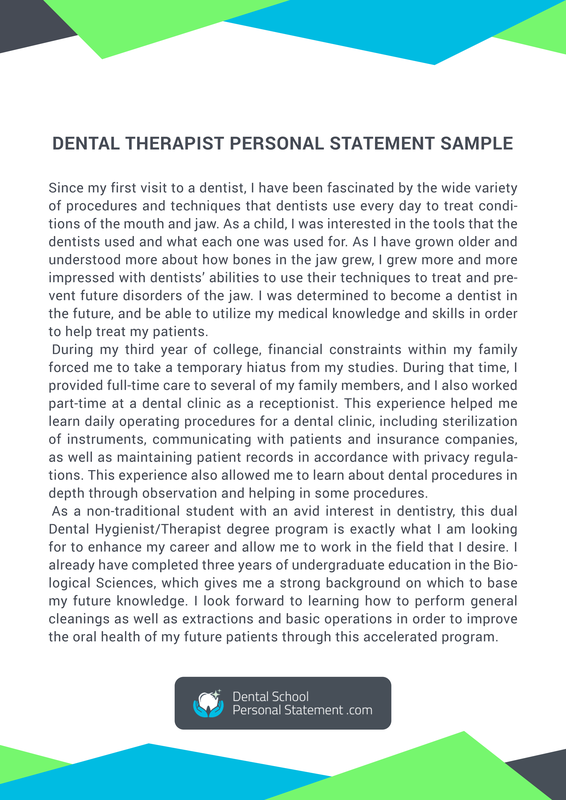 A dental hygiene personal statement is one of the most important aspects of your application thus the significance to ensure its quality, flawlessness, and effectiveness. Remember that admission committee will be reading hundreds of personal statements; to improve your admission; you should make sure that your dental hygiene personal statement must leave an impression. There are almost 300 dental hygienist schools throughout the states offering everything from a certificate in dental hygiene through to a bachelors’ or masters degree in dental hygiene. It is generally required to have a minimum of an associate degree in dental hygiene to practice as a dental hygienist, although every state has different rules and requirements. Dental hygienist training can be between 2 and 4 years in length depending on the actual qualification that you are studying for. Becoming a dental hygienist will require you to complete a 2 or 4 year degree in dental hygiene. A two year course, which is the most common, will lead to an associate’s degree in dental hygiene. Most dental hygienist schools require you to have already completed one or two years of college prior to entry onto their course. They will expect you to have completed prerequisite courses in areas such as Engklish, Psychology, Chemistry and Sociology although you should specifically check the admission requirements of the dental schools that you are looking to attend. They will also expect a good high school record and will be looking to see that you have attained at least a C grade ion the following subject areas; Chemistry, Biology, Math and English. A personal statement is more than just a chance for you to demonstrate your expertise in your chosen field but offers a great platform to discuss relevant information about yourself. There is no specific formula on how to write your personal statement for dental hygiene program so the content will basically depend on which details you consider significant. You can include your strengths, skills, interests, academic achievements and even failures you have encountered in your life. When writing your dental hygienist personal statement, you should be positive, relevant and offer an extensive insight into your personal values. It is very important to know that why you are writing the personal statement. Basically, the admission committee wants to know that why you want to become a dental hygienist, what are your experiences in the field and what qualities you possess to become a successful dentist. Start with an interesting story, that shows how you decided to become a professional dental hygienist. You can start with the story of a little boy, who was screaming with a toothache and inspired you to help all those, who are in pain. You have to be creative and imaginative, right from the beginning. Mention your work experiences passion for dentistry in strong words. Be original, but try not to be run of the mill. Write a coherent and concise note about your abilities and qualities, reflecting your passion for dentistry. Try not to copy your friends or an online sample. Write about your own passion, your own story, that will make your unique. Your academic qualification is mentioned in a resume, don’t repeat in a personal statement, rather write about those aspects of your personality which are not reflected in a resume. To become a Registered Dental Hygienist (RDH) you must not only pass your degree at your chosen dental hygienist schools you must also take and pass the National Board Dental Hygiene Examination in addition to any state required clinical exams. Some states also require exams to be taken regarding the legal aspects of dental hygiene. Your dental hygienist programs within the states in which you study will be able to provide you with all of the information that you need as well as help you to sit the relevant exams. Try to convey your message in the words limit, don’t write long stories, no one will be interested in them. Be precise, covey your message in the mentioned word limit. Don’t write your personal statement, when you are in hurry. Collect your thought and write in a clear tone and don’t forget proofread at least twice. Don’t write the same personal statement which you have written previous year for high school. keep adding your personal experiences and make sure, this time you are writing it for dentistry. Many students often experience problems when writing their personal statement which is why getting professional writing help is not only an alternative but a necessity to most. One of the best benefits of using expert academic assistance is the guarantee that you will be working only with highly skilled and qualified writers. You can be assured that your paper is top quality, devoid of any errors and non-plagiarized to maximize your application to any programs or schools. 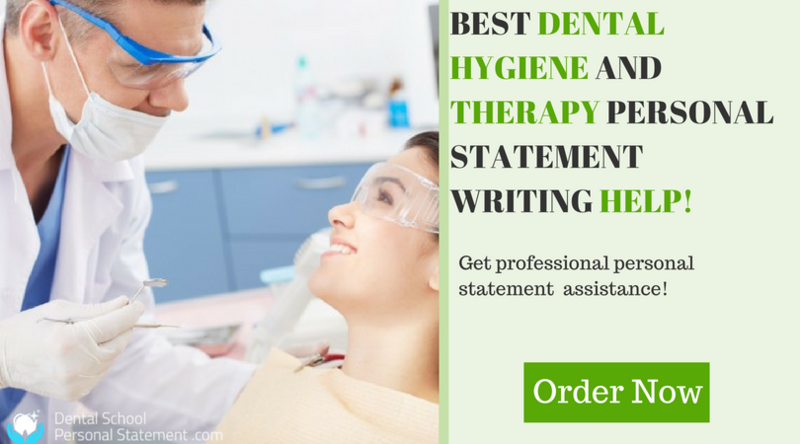 Get started now and avail the best writing help for your dental hygiene personal statement online. If you want to get into a dental hygiene school we can provide you with help in a number of ways, one of the most valuable ways we can aid you is with your dental school personal statement. Dental hygiene schools are looking for students who can demonstrate a real commitment to the field of dental hygiene; we can ensure that your personal statement says all of the right things in a way that grabs the attention of the selection committee within your targeted dental hygienist school. 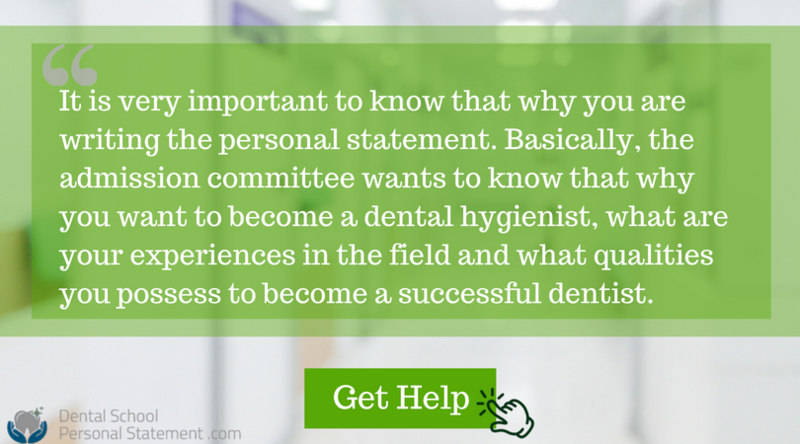 Receive your ideal dental hygiene personal statement in 5 simple steps!